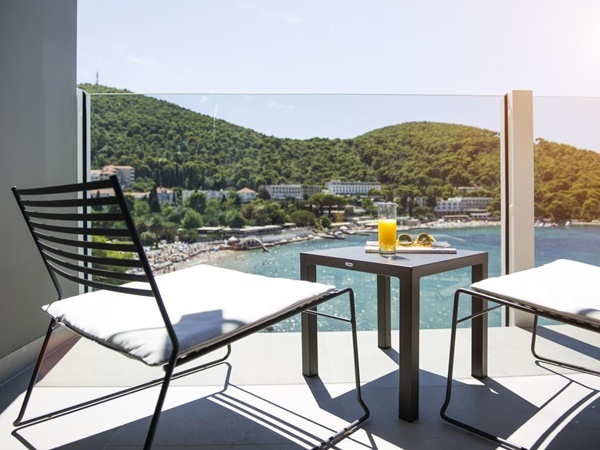 This recently completely renovated and upgraded hotel has one of the best locations among the hotels in Dubrovnik. It lies in the natural surrounding, just across beautiful Lapad bay beach and only few steps from Lapad promenade. In only 15 minutes by bus you can reach historic Old Town of Dubrovnik. Hotel Kompas features 173 rooms and suites decorated in modern style. Each room and suite has a balcony with views of the Adriatic sea. Some of the room amenities include an air-conditioning, direct dial phone, en-suite bathroom, free Wi-Fi Internet. The hotel boasts a restaurant and two bars. Rich breakfast and dinner buffets are served in the restaurant, which also offers vegetarian food. Luna bar is a small bar on the open terrace next to the outdoor pool, serving soft drinks, coffee and light coctails during the day. Zenith bar on the top floor offers amazing views of the area, serving coffee and sweets, fine wines, cocktails and beers. Hotel has a wellness and spa centre where you can relax yourself. Facilities at the Spa Center include: freshwater indoor and outdoor swimming pools, Finish sauna & Steam room, 3 treatment rooms, experience showers and relax zone. Hotel Kompas is located in the touristic area of Lapad where you will find numerous beaches, promenades with restaurants serving delicious foods, ice-cream shops. Only few minutes walking distance you will find shopping centre with clothes, cosmetic and food shops. A range of outdoor activities can be found close to the hotel. To reach the hotel from the airport you should take the airport shuttle bus until you reach the Pile Gate. From there take city bus no.4 and drive until you reach Lapadski dvori I bus stop. Take the road down and then turn right until you reach the hotel. If you prefer more comfort pre-book your private car transfer from Dubrovnik airport to Hotel Kompas. Hotel features a high tech conference room for up to 400 peopoe, with natural light and the latest technical equipment.